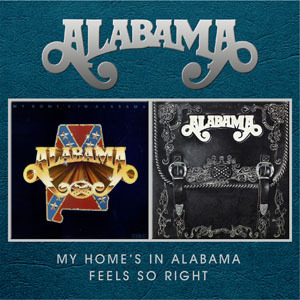 ALABAMA was the first country music supergroup. Their total album sales topped 70 million, placing them among the top-five best-selling country music acts of all time; and among the 20 best-selling recording acts of all time in the United States. Two tracks featured here - Tennessee River and Why Lady Why - were the band' s first two number one hits, and laid the foundation for what became one of the most impressive popularity runs in country music history. Alabama retired from the road after a sold-out 2003-2004 Farewell Tour. For more than twenty-five years the four-man band had stood tall as the pre-eminent American country-rock band. Alabama' s sales history and list of awards and accomplishments in its 25-year history are staggering. In 2005 they were inducted into the Country Music Hall of Fame, a much deserved accolade for Alabama' s unmatched longevity in the country music marketplace.